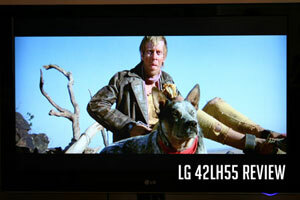 Price Considerations: The LG 42LH55 is hitting a very attractive price/quality price point at around $1500 all in. It compares extremely well in price to not only other LCDs in it's quality category but also upper end plasma models. Its a bit more than the Sharp Aquos LC40E77U which sells for around $1000 but with 2 inches less in screen size and less features. The Samsung UN40B7000 is slightly higher at $1650 and has a similar feature set and compares well, but again with 2 inches less. Quality Comparison: With picture quality, reduced motion artifacts, increased response time, sleek good looks, a swivel stand, good menu system and excellent calibration this LG is comparing well with the best TVs on the market – even top tier plasma (now that Pioneer is out of the game). HQV Benchmark: Processor testing with the LH55 showed excellent results..
Special Note: One of the foremost adjustments to make with this TV is to turn the 120Hz/240Hz TruMotion processing off when watching film based content. Doing so will yield a much more natural picture as the film director intended. While this feature is great for sports programming and gaming, leaving it on even at the low setting will present you with unwelcome added effects in motion scenes in particular. Strange "canned" background set visual information will appear and disappear depending on whether there is motion. HD Picture Quality: Dark shadow detail and color information in the new Blu Ray release of The Road Warrior was very accurate. I was extremely happy with motion sequences, black levels, and let it be noted that the anti glare screen can be a big plus with ambient lamp lighting in a room. Deep Black levels provide for excellent contrast in this scene from The Road Warrior. Digital Broadcast Signal Picture Quality: The TV did a remarkable job with this process and displayed a beautiful picture with natural colors, good black levels and lots of detail. Color information was vibrant but not over saturated in The Three Amigos and our staple copy of Risky Business which usually presents TVs with more problems that it did the 47LH55. 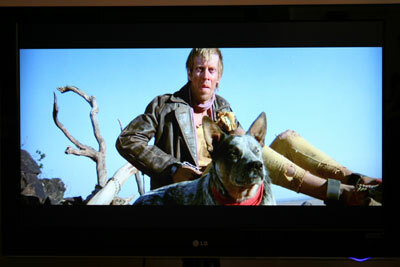 I was very pleased and impressed that LG has not overlooked up conversion processing from a lowly 480i signal source. 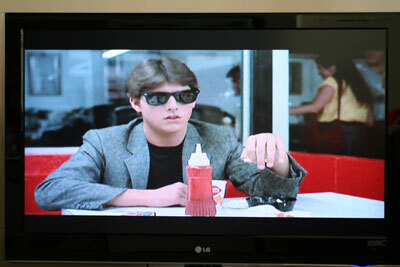 This shot of Tom Cruise in Risky Business shows a good contrast presentation from this rough 480i DVD. Contrast Measurement: Though certainly not the richest and deepest we've experienced, black levels on the 42LH55 are adequate and the excellent dark shadow gray scaling helps to make up for any deficiency in this area. LG lists a dynamic (read dubiously tested) contrast ratio of 80,000:1. Our post calibration ANSI contrast measured modest but respectable 861:1. This TV has great balance and during viewing we did not sense a lack of deep blacks or of bright whites during sunlit scenes. To See more detailed notes on dark shadow detail, color accuracy, viewing angle, and motion lag please click here to see the extended review. Features: The LH55 is not LED backlit but nevertheless uses less power and is Energy Star 3.0 rates. As mentioned above, the TruMotion (120hz/240hz) feature is a key element of this TV. It works for sure, but should be turned off for film based and TV content. It will provide many unwelcome picture oddities with film based content. Sports programming and gaming are awesomely enhanced by the TruMotion feature. There is a keen new Picture Wizard feature which gives some basic calibration tools to allow users to adjust the 5 basic settings depending upon ambient room light. It's an interesting and somewhat useful feature that we have not encountered before. To see the extended review on video aspect ratio, inputs, aesthetic considerations, remote and menu functionality, and audio function click here. Review Equipment Used: Sony Blu Ray BDP-S1 High Definition DVD player, Sony DVP-S50 DVD player, Sencore Color Pro 5000, Sencore Auto Cal Pro ACP6500, Sencore signal generator. This review format and all of the headings, sub headings and paragraph titles are part of a copyrighted process. Any unauthorized reproduction or use, either in full or in part, of this product review format is expressly prohibited.